It’s been a long weekend full of family step-drama, and subsequent planning for this winter and spring. These next few weeks will be bumpy, but I’m confident that it will turn out for the best. I’ll share more when final decisions have been made. So, I’m exhausted and going to bed early. I want to get some good work in early in the week. After all these years, still the best way for me to totally disconnect is to take a long hot bath with a good book. No electronics. No distractions. Usually Nevermore or Isis comes to hang out (Nevermore as a loaf, Isis as a swirl). A slow evening at home (that 5 hours of sleep was rough). Made some vegan blueberry pancake comfort food. Took a long hot bath while watching House and had a stack of books for after. Rotating kitties kept me company. Winter World, Bernd Heinrich (I loved Mind of the Raven). In spite of the fact that my husband and I have been sick for a week (is this turning into bronchitis?!) and I’ve been feeling crappy off and on for a few weeks now, I just had a great weekend. Sometimes a quiet weekend at home is exactly what I need. No need to leave the house (except for the yard, or a walk around the neighborhood), and certainly no reason to drive anywhere. Hubby and I did mostly our own thing, except for watching Rome together, an old series we’re working our way through on Netflix discs. I read most of Will Potter’s excellent Green is the New Red, which I’m going to finish after this post. I caught up on a bunch of vegan podcasts while doing stuff around the house. I henna’d my hair. I started some lentils sprouting in a jar, which is something I’ve been wanting to try for a while. It was a slightly warm and sunny weekend, so I was able to take Pip, Isis, and the dogs out into the backyard to hang out a little. (Gordy and Nevermore were not very interested, but Gordy logged some good time on the porch. Caesar even came out to the porch for a bit.) I took Ruby for a walk, trimmed the dog’s nails, and brushed Bubba and gave him a bath, which hadn’t happened for a looong time. Due to his health issues, his coat has not been in the greatest shape lately, and he seems to always be shedding and shaggy—half a pug of fur is now in the back yard. This evening I even had a little time to research some news for the next show. Poor Pip, the pain med that the doctor gave her for the extraction seriously cracks her out. Fairly immediately, her eyes glaze over and she loses coordination. In fact, we’ve had to keep an extra eye on her. This ordinarily very agile cat is having problems judging the leap to the cat tree, etc. And she somehow banged herself up in the night—she has a divot of fur out next to each eye (worse near her right eye). It could be that she had a tussle with one of the other cats, but I don’t think so. So tonight we’ll make sure to confine her to the bedroom. I’d almost rather not give her the pain med if its going to mess her up like that, but then I don’t know how bad the extraction might be hurting and she can’t tell me. Yesterday she did seem to be uncomfortable eating, so it probably does hurt—a lot. At least I know she loves going outside and was able to do that for her. Both days I began to feel tired after about 4 hours, so it was great to have nothing that had to get done. Hopefully it was enough rest to kick this and be able to start my work week feeling good. More and more lately, Isis is carrying little stuffed animals and wine corks around at night. She’s been into wine corks for a few years now and will jump up on the counter to steal them; She leaves them all around the house. The stuffed animals are a more recent fetish—some of them are small dog toys. She will position herself on the 1st floor, or the stairs, or in the hallway, always a bit out of sight, and then will cry mournfully and loudly until we acknowledge her by calling out her name or coming to find her. She always drops the toy or cork as soon as she sees us looking at her though. I would find it pretty weird, except my cat Queequeg used to do the same thing. She even had one favorite little stuffed monkey that I had gotten at a forensic science conference as a promo (it had a t-shirt on it with some forgettable company name). Queg used to cry out very late at night, often at the bottom of the stairs, and she would invariably have the monkey either in her mouth or right next to her. Isis and Queg are the only two cats I ever remember doing this. And I’m not sure why they do/did it. So I take it for what it seems like—a blatant need for attention and love. And that is what I’m happy to give. When you were, literally, born to run, and you were selectively bred for hunting by sight, it’s sometimes hard to differentiate between what is appropriate to chase (or hunt) and what is not in a household environment. 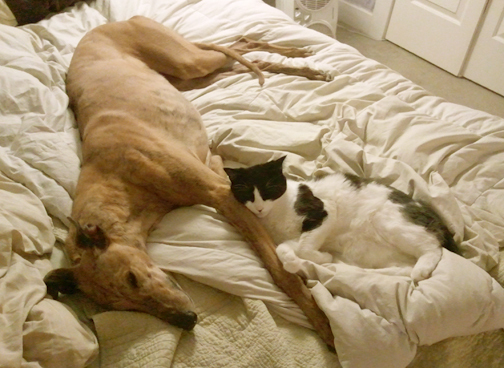 Fortunately, we’ve never had a problem with our greyhounds and our many cats. For the most part, there’s been mutual avoidance. However, our youngest cat Isis, who grew up with three dogs, does not understand this. She is full of love, and she never, ever, gives up. Ruby might not be a cat lover, but she more than “tolerates” Isis, who has definitely worn her down over the years. She no longer gets up and leaves with a disgusted look when Isis comes by to nudge her long snout with her buzzsaw purr, or to wind in and out of her legs. If Isis wants to flump near her, even touching her, it’s OK with Ruby, as long as Isis doesn’t get too carried away. Ruby pretends to be aloof—but you can tell she’s loving every minute of it.